As Register, I am committed to carrying forward those traditions and to modernizing facilities and services to meet the changing needs of the public in this new century. Subscribe for free alerts and updates about your deeds and titles. Click below to learn more and sign up. 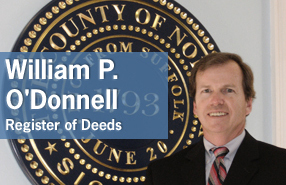 Register O'Donnell Discusses Deed Scams w/ Channel 7 Reporter Hank Phillippi Ryan. Good Deeds 2018 End of year Report with Register Bill O’Donnell and BCAM TV host Keith Erickson.